The rich taste of venison gives this pie a wonderfully robust flavor. Peel or scrub potatoes and cut into egg-size pieces (leave whole if small). Cover with water and 1 tablespoon salt, bring to boil and cook until potatoes are soft, about 20 minutes. Drain. While potatoes cook, mix venison with 3/4 teaspoon salt, 1/4 teaspoon pepper and 1/4 teaspoon ground allspice. Chop onion and carrots and slice garlic. Heat oil in a heavy skillet. Brown meat and spoon out into pie dish. Add carrots and onion to skillet and cook until onions begin to brown and soften, about 5 minutes. Add garlic, stir in and cook for another minute or two. Add 1/4 cup water and stir to dissolve any browned bits in the pan. Add 1 3/4 cup broth to pan. Mix remaining 1/4 cup broth with 2 tablespoons cornstartch to a smooth paste and stir into pan liquid. Add ketchup and Worcestershire sauce. Cook, stirring constantly, until liquid thickens - about 2 minutes. Taste for seasoning, add salt if necessary. Pour contents of skillet into pie dish. Heat milk and butter together. Mash potatoes, adding milk mixture as needed to get a soft but not soupy consistency. 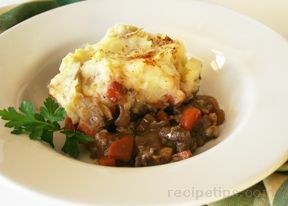 Spread potatoes over meat mixture and bake 20 - 25 minutes. Serve hot.